M0PLA/P SOTA Activations: 30th June 2017. GW/NW-001 SOTA Activation visit. Today's Summit is Snowdon, Jamie my son did say about 2 or 3 months ago Dad why don't we activate Snowdon for your Birthday. We set off from home (Telford) with Amy and Richard additional family members at 05:30 a.m. and headed towards Wales on the A5 as most of our SOTA Activation's have been over the last 2 months or so. We arrived at Pen-Y-Pass car park at 08:00 a.m. and paid the £10 car park fee, I used coins and didn't risk the notes. The map above shows our ascent up the Pyg Track which took us 2 1/2 hours with a few rest stops including taking a few photos and our descent down the Miners track which also took 2 1/2 hours again with photo stops. The weather was not great and we went into cloud covering at around 650 Meters, this made our journey not so exhausting as it kept us cool. We were lucky and it didn't rain until we made the summit and then it was only a very light shower. Once we arrived at the summit I set up the 2M dipole and also a 2M beam I had made earlier this week, My main Birthday present was a new Hand Held (Yaesu FT 270 R/E) and this was its first proper airing. 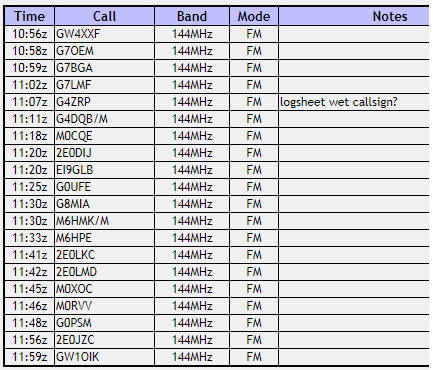 I managed 20 QSO's with a lot of my usual chasers and a few club member's from TDARS. The beam seamed to be working well with some good working reports, M0CQE (Paul) informed me it added 2 S points extra to my dipole. I have not been up Snowdon for 18 years and it would have been better with scenery but we cant always have what we want. Again another great SOTA Visit and as always I enjoyed talking to everyone. The end of the activation was getting very cold with the damp from the clouds and the wind chill, I would have loved to have stayed longer but as we all know our health and safety is more important than our hobby.